FYI I haven't gone postal at my workplace despite the tone of my last post of many months ago. 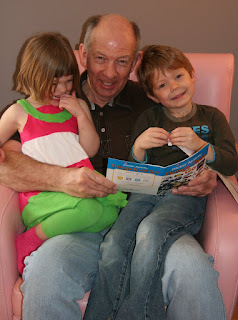 I've been busy with the regular stuff of life...work, kids, house, and the juggling act these elements of life require. Our renos are done (more or less). A post with the details on this event is forthcoming. As a teaser though I must say our colour choice rocks, our flooring is awesome and we now have a very livable space. 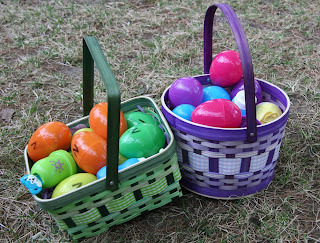 Today's post though is about family and Easter. We are not an overly religious household. We observe the holidays but in a fairly secular way. The focus today was the Easter bunny. There wasn't too much pomp or fanfare but it was a nice day, especially since we are experiencing warm temperatures (around 20 degrees celsius). My folks are in town which is a real treat. 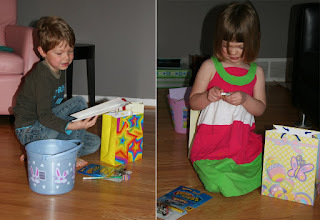 It is the first Easter they have spent with our kids. Monkey boy and lil bug woke at their usual 7am time (our boy has a very defined inner clock). I had placed gifts from our siblings and the cards from our parents out on the dining table. They had a hoot checking out the loot they received...pez dispensers, books, bracelet and clothes were quickly viewed and checked out. It was enough to keep them in check until the grandparents emerged from our luxurious basement (again a teaser for a future post). They received cards from both sets of grandparents containing money (which my little shoppers always like to have in their clutches...Monkey can save and budget but lil bug will spend quickly). Then it was on to the treasure hunt. I love this part. 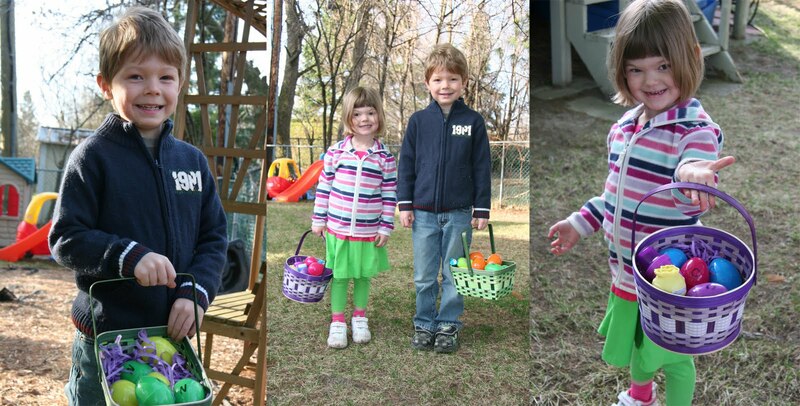 I created easter bunny faces, commissioned J and my folks to decorate them and I wrote a clue on the back. It was so much fun watching them run around the house finding clues and then the treasure from the Easter bunny. 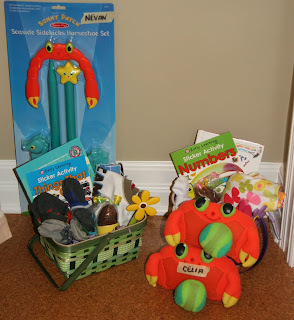 This year I gave them a basket filled with a book, clothing and outdoor toy purchased on my line of credit at a consignment store (I love boom kids here in Ottawa). 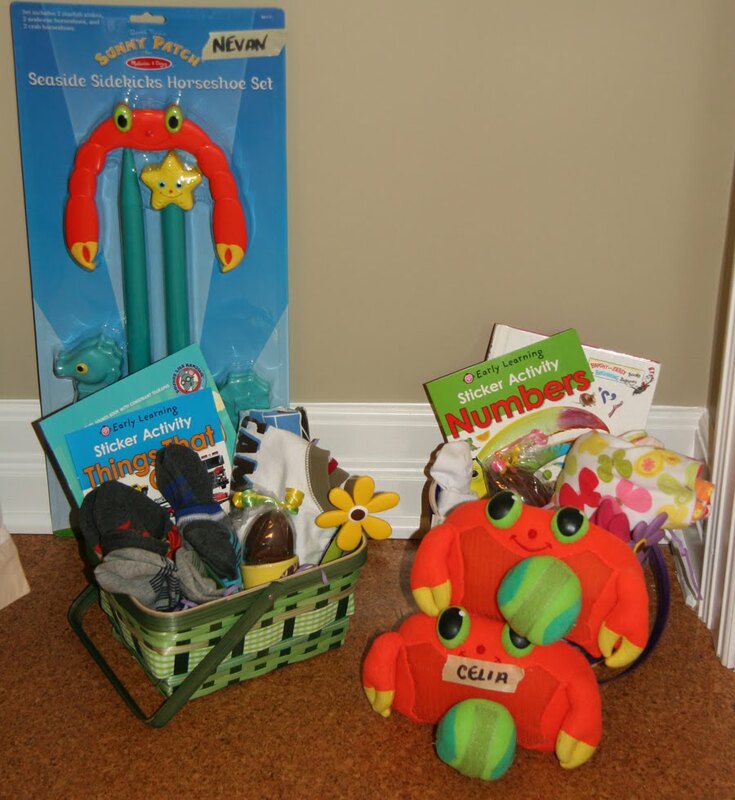 I also gave them each some much needed socks, activity sticker book and a chocolate Easter egg perched inside a egg cup from Laura Secord. Yup I spoil them and there was even more to come. I forced the kids to eat a bran muffin and some fruit before they could venture into the backyard to find all of the colourful eggs the Easter bunny left behind. This too was a hoot to do for them. This was such a fun part of the morning that I wished I had more eggs to hide just to see the pleasure on their faces when they discovered a hiding spot. Thanks to my mom, who stuffed lil bug's eggs with mini-Oreo cookies and monkey's with licorice and then labelled them with their first initial, this event went smoothly without a single child bickering or crying. The adults were finally given a turn to have breakfast and the children relaxed in the house enjoying way too much junk and a little t.v. time. After the dishes were done my mom took the kids out biking. You would think this would be an ideal time for the rest of us to relax. Well that wasn't in the agenda. J worked on putting marmoleum (again this eludes to my future reno project post) down in our front entrance area. This meant cutting the marmoleum to the right size and removing the existing 1960's lino from the entrance. A bigger job than anyone expected especially considering he still isn't done removing the paper backing from the floor. My dad and I spent the better part of the day assembling a treat J and I have been wanting to get the kids since last summer. 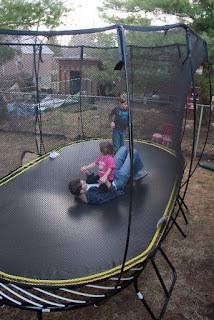 We bought a trampoline (a springfree trampoline). I purchased the oval (8'x13') sized trampoline. I tried to find a second hand one but it seems like that I wasn't the only one wanting one. There were 10 wanted postings last time I checked on usedottawa and not a single large sized safe tramp for sale. So I decided to try Costco. This particular brand has typically been carried by Costco but when I checked with them they did not have any on order. I decided to go directly to the company. I spoke with some very informed customer service people. One told me about the product and let me know that Costco hadn't ordered any this year. She then passed me onto the order department. I was willing to fork over some money for the product depending on the shipping costs. The kind person on the other end asked which ones I was looking at and then recommended I not purchase through them but order them through Sears.ca or Canadian Tire. She said not only were they cheaper than their pricing but I could also avoid shipping costs. Now that is true customer service. I put one of the few remaining trampolines on hold at our nearby crabby tire (I say this cuz the service although not unpleasant is so agonizingly slow). Dad and I started the assembly process around 10am, took a break at 12:30, resumed at 2pm and finished by 3pm. Yup not exactly a quick process considering my mom and J both helped with the rod installation while I fed the kids and prepared an adult lunch from 11:45-12:30. 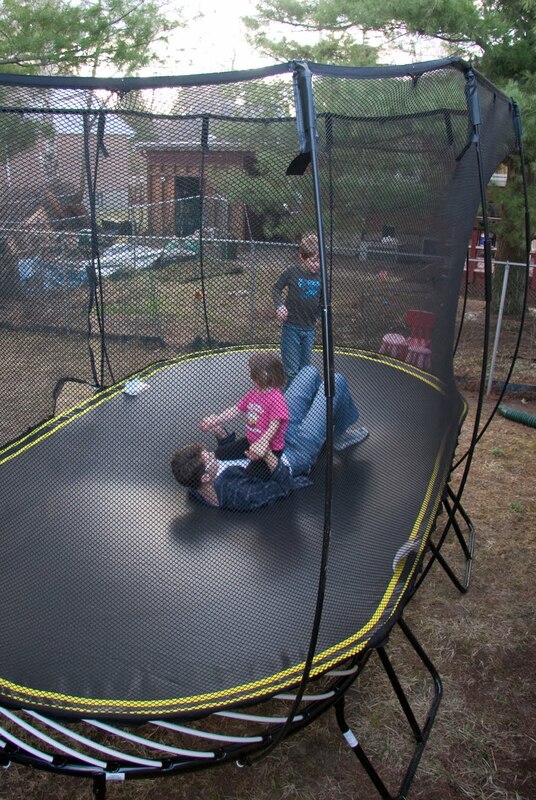 Despite the cost and long set up time, the trampoline is terrific. Both kids loved it. Monkey boy has already figured out how to seat and stand up in a bounce (quite a feat for a kid who hasn't spent much time on a trampoline). Our neighbours also joined in the fun. They have two girls. One is a year older than monkey and the other is the same age as bug. We cut a hole in the fence between our yards so they could play more. 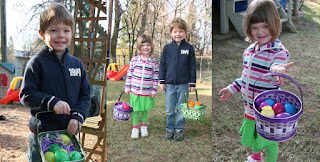 So far it is working out, even though our youngest both tend to be strong-willed. All in all a great but exhausting day. I love family and creating memories.